Addition, Subtraction, and word problem assessment. 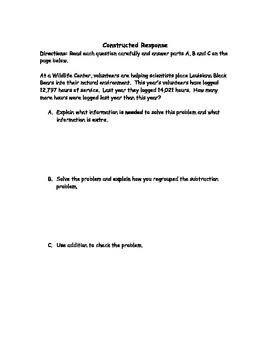 This test requires regrouping, explaining whether there is extra information in a problem, and a constructed response question. This would be good for 3rd-4th graders. The problems include 3-5 digit addition and subtraction problems. 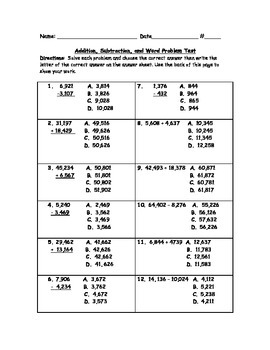 Numbers 1-12 are just addition and subtractions algorithms with and without regrouping, #13-20 are word problems, and the last problem is a 3-part constructed response question. 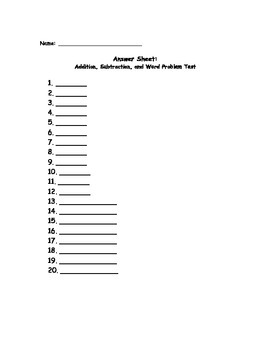 There is also an answer sheet on which students can mark their answers. This makes for easy grading!